Fellow Building Collector Joe K. sent me this tip about ceramic tiles he saw at an art show in the N.Y.C. area. New York relief tiles are handcrafted by Denis De Long, a NY artist who sells her items online and in area markets. What a great idea for accent tiles in a kitchen or bath of an architectural enthusiast. There are incredibly detailed with various scenes of New York City. 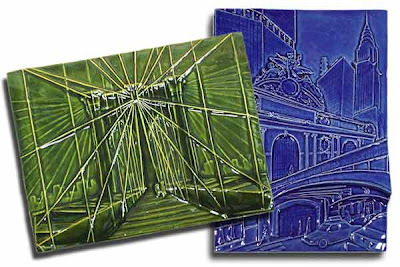 Square ceramic tiles of The Brooklyn Bridge and Grand Central Station are included. She also makes ceramic ornaments of the Chrysler Building, East River bridges, Manhattan Skyline, Saint Patrick’s Cathedral, Statue of Liberty and Washington Square Arch. Denise describes her aesthetic as “Urban Craft” to “Mid-Century Modern”. The New York City Tiles and Ornaments celebrate today's urban experience while paying homage to such architectural treasures. She is inspired by the unique landscape of the city and the never ending energy of its people. Labels: Architecture, Art, Ceramic, N.Y.
thanks for the post. I'm at Union Square Holiday Market this year, I'll be there through Dec. 25th.